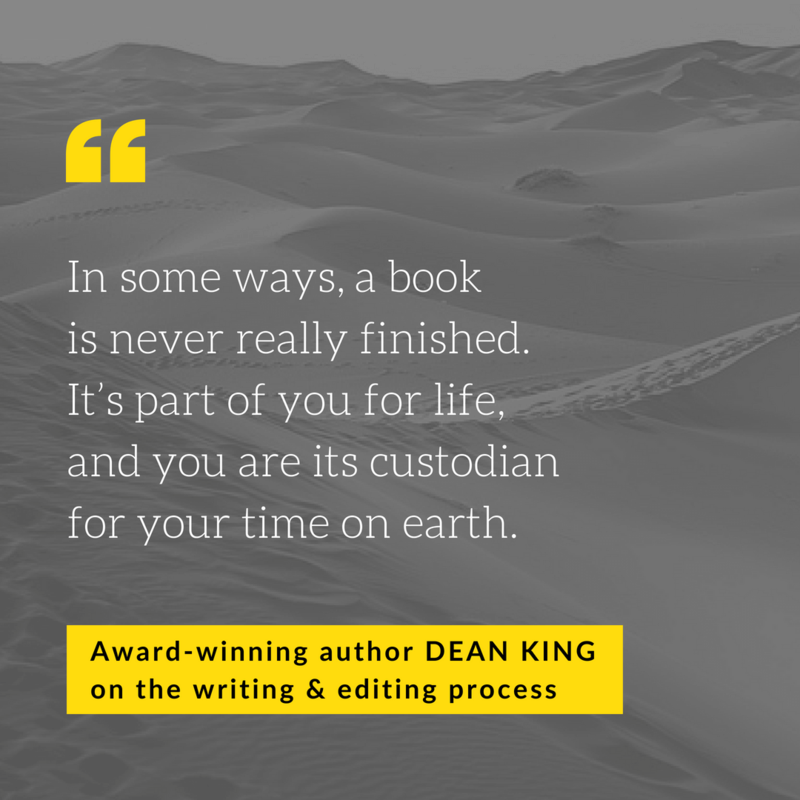 Dean King is an award-winning author of nine non-fiction books. Dean has chased stories across Europe, Asia, Africa and now Appalachia. His goal is to draw you into a nuanced and accurate historical narrative that allows you to live with the characters, to feel their pain, striving, and joy, and to grow with them. He rides the camels, climbs the 14,000 foot passes, walks the yard-arms, and tracks down far flung sources. (He was shot at beside the Tug River while researching his latest book, THE FEUD.) Then he writes and edits until his knuckles have no skin, his elbows ache, and his family is looking for him, all to give you pleasure in lean and meaningful prose. If he makes you eager to take his book to your favorite easy chair or crawl into bed and curl up with it, he’s happy. If you learn something or feel changed, then all the better. Dean’s writing has appeared in Granta, Garden & Gun, National Geographic Adventure, Outside, New York Magazine, and the New York Times. He is a contributing editor of Virginia Living and a nationally known speaker, who has been the chief story-teller on two History Channel documentaries. Kris: I’ve found everyone seems to have a different approach to editing. After you finished your first draft a project, what did you do next? Okay, after the beer or nice glass of wine (scotch? ), what does your revising process look like? Dean: There is no first draft. The whole thing is a living, palpitating, ever-changing beast. When you finish the end, you have to go back and adjust the beginning. When you adjust the beginning, you have to go back and tinker with the center. 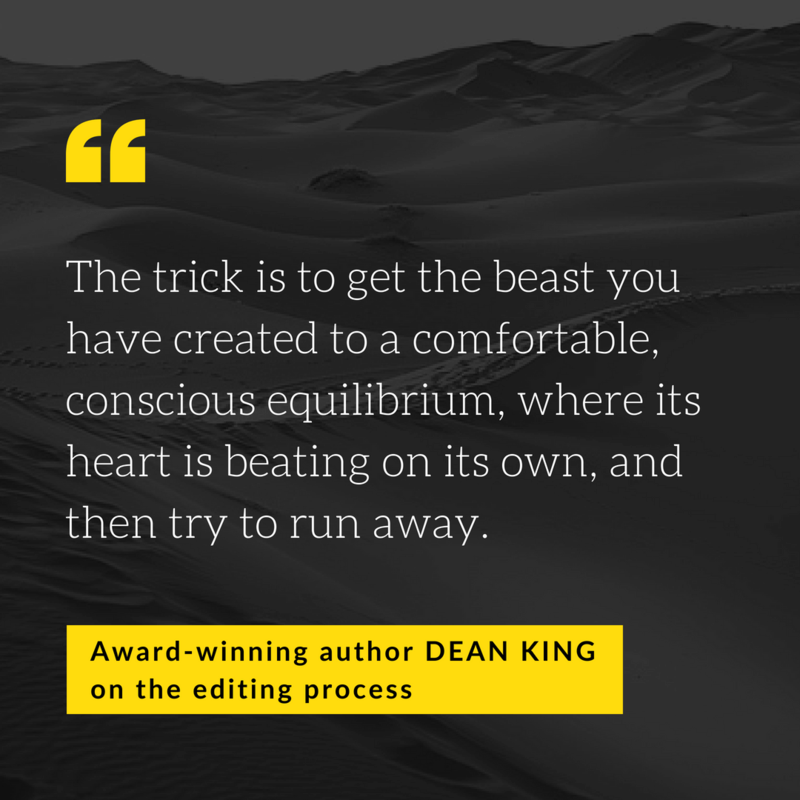 The trick is to get the beast you have created to a comfortable, conscious equilibrium, where its heart is beating on its own, and then try to run away. It will chase you, and it’s faster than you are. Kris: Oh, I absolutely know that feeling. So, if there is no “first draft,” what does this editing process look like for you? Dean: I like to think I layer. I layer in the sources, and each time I layer in a new one, it effects all the ones that came before. It’s a laborious but beautiful process that lets all the documents and research and all the previous tellings of events contend and wrestle with one another. In the end, it is my blending, shaping, and interpretation of these things that becomes my narrative. Kris: Has this process evolved between your first book and your more recent publications? Or more specifically, what have you learned works really well for you, and what doesn’t? Dean: When you first get started, there’s no way to know how much time and effort it will take you to write a commendable book, because you have never done it before. It’s so much work and time that it is not imaginable. When you can’t look at the thing any longer, then go find another source and some new facts that carry you back into the story. Revise, reread, revise, until someone makes you stop. Kris: Your writing explores stories across cultures that are often not your own. How do you review your work in regards to being authentic and telling the truth of that culture, place, and time? Dean: Go there, or as close as you can, spend time with people, and be prepared with knowledge. You may think you cannot travel back in time, but you will be surprised. When I went to the Sahara [researching Skeletons on the Zahara], the things I experienced were exactly the things I thought were no longer part of the culture. And the facts I set out to verify and thought I could were unascertainable. The story I most often tell about this is when I fell off my galloping camel, and my guide told me I was okay because camels are sacred and those who fall from them are never hurt. Although I was checking for cracked bones, I had a smile on my face, because Riley had reported that when he fell from his camel he was told the exact same thing in 1815. It not only verified a part of his narrative that I was unsure of, but it connected us across all that time in a shared experience. In fact, everything that went wrong on my expedition, which was only three weeks after 9-11, was everything that went right. If the journey had gone exactly as I had planned, it would not have taught me nearly as much about Riley’s hardships as the hardships I experienced ultimately did. Challenge your own preconceptions and prejudices. Question what you know—or think you know. Be open to transformation. That is when you can transcend from reporter to storyteller. Kris: When you’re looking at a specific scene in your text and ensuring that its setting vivid and alive for your reader, what do you find yourself adding in? And/or what do you find yourself taking out? Dean: When writing a scene, it is important to build it one moment at a time. The writer has to stay in the moment and not give away what’s coming next. I also find myself looking for the right place to stop. “Elison Hatfield grasped the stone in one hand. He lifted it, and with all the strength he had left, he brought it down on Tolbert McCoy’s head. He heard the gut-wrenching crack of rock on skull as the blow hit home.” That’s a good place to stop. Hatfield has been stabbed and bleeding just before, and there’s a knife in his side. McCoy has now suffered a brutal blow, but what is the result? Well, you have to read on into the next chapter to find out. Kris: Right. Telling a story is one thing, but writing a page-turner is something you’re a master of. After your initial ideas are on the page, how do you elevate your writing in regards to pacing and suspense? Dean: I visualize it like a movie. What are the active scenes that can be described in a gripping way? End a chapter as per above, and then at the beginning of the next chapter feed the reader context, history, science, whatever you want to feed them that might otherwise slow the narrative down. They will fly through it, absorbing some, to get to find out what the result of the action at the end of the previous chapter was. My favorite example of this is in two of the Aubrey-Maturin books by Patrick O’Brian. The sea captain Jack Aubrey is sent on a mission in one book but ends up in a battle with a pirate ship before he can take the town he was sent to take. The book ends with a rousing sea battle, but you still don’t know if his actual mission was successful. At the beginning of the next book, where you expect to find out quickly, O’Brian doesn’t tell you. It’s not until a hundred pages in that a spy looking down from a tower tells a companion, “There’s Aubrey, the captain who . . . ,” that you find out (I had to cut the spoiler). O’Brian was having great fun with that, and I admire his constraint. Kris: Now, what does your editing process look like in regards to double-checking your extensive research? Kris: I like that you put “facts” in quotation marks. They do so greatly depend on your source. 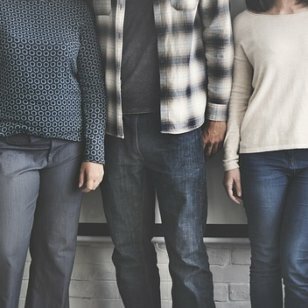 Beyond interpreting your research and being thoughtful in its presentation, what do you wish more writers knew about the writing and editing of narrative nonfiction? Dean: You can never read your own work in progress too many times. 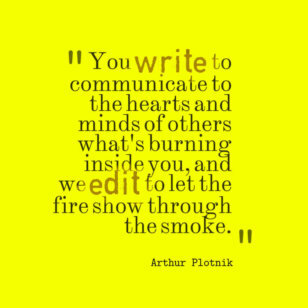 Relentless rewriting and editing is essential. Every sentence should be a good one. Every paragraph should be tight. 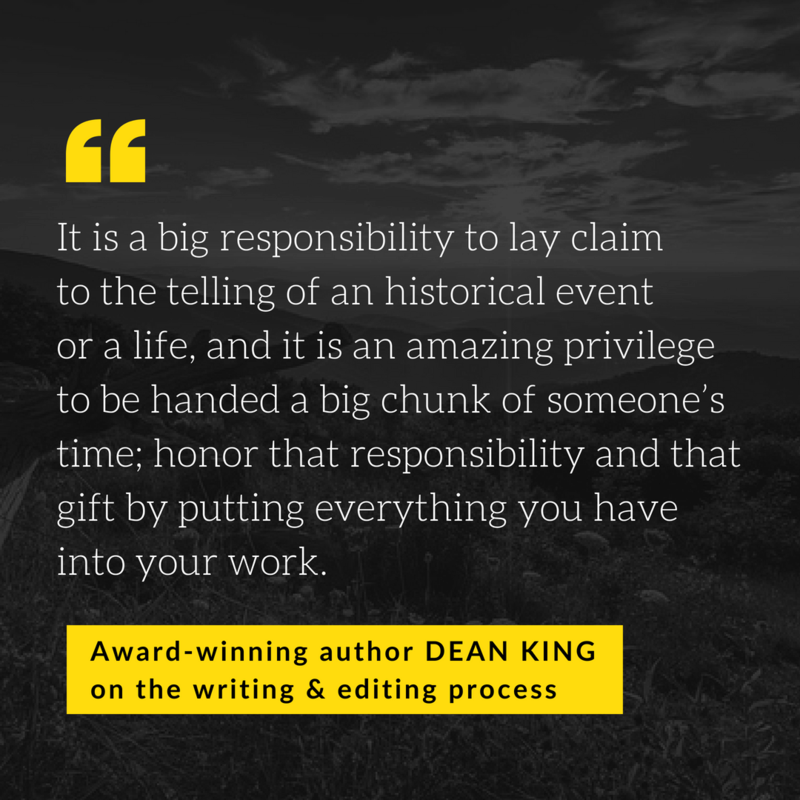 It is a big responsibility to lay claim to the telling of an historical event or a life, and it is an amazing privilege to be handed a big chunk of someone’s time; honor that responsibility and that gift by putting everything you have into your work. It’s important. Kris: Is there a difference between editing narrative nonfiction versus biography? Dean: I think biographies should read like good narrative nonfiction. I wouldn’t edit them differently. Insignificant details should be omitted from both. The trick is figuring out was is insignificant. Kris: When do you know your book is finally done? Dean: In some ways a book is never really finished. It’s part of you for life, and you are its custodian for your time on earth. Deadlines are nice, and when the publisher starts charging you for any more changes, that’s when you know you have to stop. Ha. True. After writing my Patrick O’Brian biography and having it published in hard cover and serialized in four full pages in the Daily Telegraph, I received a letter from a woman who had had an affair with O’Brian at a particularly important point in the narrative. She sent a photograph of them together. I interviewed her by mail and added another thousand words to the paperback to cover that. Eventually, I want to let go though, and I do. I don’t want to be the world’s expert on all my topics for all times. Other people devote their lives to these things and to preserving the books, document, houses and other things of history, and I want to keep moving and tell other great stories. But I do keep files on all my books with correspondence and updates. Being a successful author takes work. That’s the side of the writing life we can’t forget. Doing the work and doing it well takes time, endurance, and fortitude. But there’s also the adventure of the process, discoveries to be made in every stage that make a profound difference on a project and on you as the writer personally. Even falling off camels can be a positive step forward sometimes. We all have to find our own rite of passage. Whatever yours may be, good luck with it. 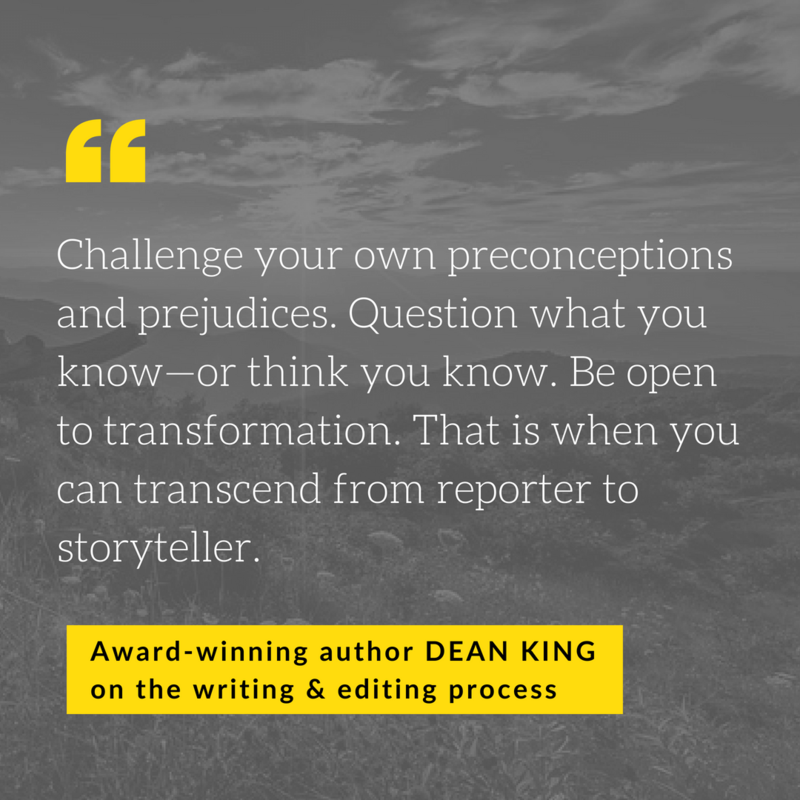 Thank you so much, Dean King, for taking the time to talk about your craft with me, and happy writing, folks! Join 675+ subscribers and sign-up for my monthly email newsletter for more interviews like this. 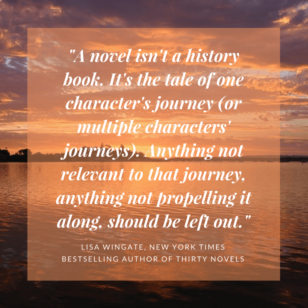 Authors on Editing: Interview with Lisa Wingate Editing Flash Sale!